The boldfaced hornet gown to just over 1.5 inches in length, and is known to be attacking and fierce towards human when humans come near their nesting areas. They can be spotted by the yellow tail with a black midsection to their bodies, as they nest from suspended structures or up in tree limbs. They are dangerous to humans as they pack a powerful sting that can be even more harmful to those who are commonly found allergic to them. Yellow Jackets are usually about an inch to an inch and a quarter in length, known for their black, yellow, and sometimes white coloring to their abdomens. This species of wasp is most active in the summer months as well, feeding on caterpillars and other insects, effectively helping to control the insect populations in areas they live and prey in. Yellow Jackets pack a dangerous and painful sting, mainly occurring when they are provoked when people get too close to their nests or attempt to remove their nests, commonly found up in trees, or in wall voids, attic spaces, and even underground. Paper Wasps are normally about an inch in length, identified by their brown color and yellow stripes circling their bodies. They are most active in the heat of the summer, when they can be found feeding on the wide array of insects common to our areas in the late summertime heat. 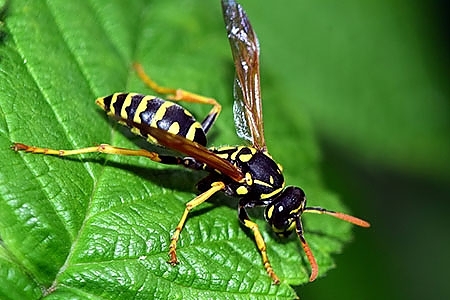 These wasps can still be aggressive and will sting when in contact with humans, but these wasps are considered the least aggressive of the three mentioned in our database. Wasps are truly a nuisance as no home or independent structure is off-limits from them. They will protect their nests and fend off those nearby with powerful stings that can be harmful and painful. We advise you to contact the professionals when wasps are found instead of trying to deal with the problem yourself.